Are light bulbs banned? What you need to know about the new energy regulations. The Department of Energy's latest regulations affecting incandescent lighting go into effect on January 1, 2012 with more types of bulbs (lamps) following on July 14, 2012. The legislation does not ban conventional light bulbs, but does require energy efficiencies that are not possible with standard incandescent technology. The good news is that it's easy to find halogen, fluorescent, and LED equivalents to the lamps being phased out. 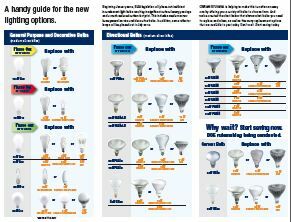 For now, you will continue to see these lamps referenced in our part numbers and descriptions (e.g. "N100" designates an incandescent lamp UP TO 100 watts may be used). We'll be happy to assist you with making your current Manning products more energy efficient, from recommending the best lamps currently available to a complete retrofit of existing fixtures with lighting packages for optimal efficiency. Just give us a call or click the "Contact Us" link at the top right of this page. Manning Lighting will continue to develop new energy efficient technology, including new LED lighting options in 2012. Stay tuned! UPDATE: In mid-December 2011 Congress passed a provision that prevents the government from enforcing the phase out of some incandescent bulbs until at least September 30, 2012. Nonetheless, many bulb manufacturers have already ceased production of these items, and more efficient replacements are widely available.